Scanning Electron Microscopes (SEMs) are used across a number of industrial, commercial, and research applications. From cutting edge fabrication processes to forensic applications, there’s a diverse range of practical applications for the modern SEM. 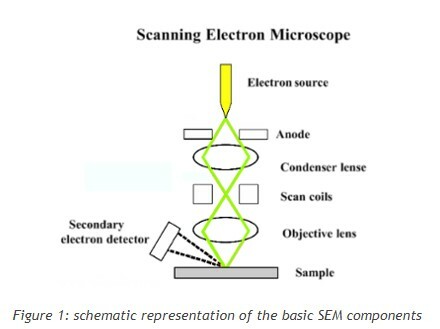 A schematic representation of an SEM is shown in Figure 1. Electrons are generated at the top of the column by the electron source. They are then accelerated down the column that is under vacuum, which helps to prevent any atoms and molecules present in the column from interacting with the electron beam and ensures good quality imaging. Electromagnetic lenses are used to control the path of the electrons. The condenser defines the size of the electron beam (which defines the resolution), while the objective lens’ main role is the focusing of the beam onto the sample. Scanning coils are used to raster the beam onto the sample. In many cases, apertures are combined with the lenses in order to control the size of the beam. Different types of electrons are emitted from samples upon interacting with the electron beam. A BackScattered Electron (BSE) detector is placed above the sample to help detect backscattered electrons. Images show contrast information between areas with different chemical compositions as heavier elements (high atomic number) will appear brighter. A Secondary Electron (SE) detector is placed at the side of the electron chamber, at an angle, in order to increase the efficiency of detecting secondary electrons which can provide more detailed surface information. How is electron microscopy different to optical microscopy? The key difference between electron and optical microscopy is right there in the name. SEMs use a beam of electrons rather than a beam of light. An electron source located at the top of the microscope emits a beam of highly concentrated electrons. Thermionic filament – A Tungsten filament inside the microscope is heated until it emits electrons. A Tungsten filament operates at white-hot temperatures which means it gradually evaporates with time and eventually breaks which can contaminate the upper part of the electron column. The average lifetime of a Tungsten source is about 100 hours, depending on the vacuum. Field emission gun (FEG) – Generate a strong electrical field that pulls electrons away from their atoms. This is typically the more popular choice in SEMs as it generates high resolution images, however it requires a vacuum design that often comes at a high price. Cerium Hexaboride cathode (CeB6) – provides ten times the brightness compared to Tungsten which means a better signal-to-noise ratio and better resolution. A CeB6 source typically provides more than fifteen times the service life of Tungsten: 1500+ hours. A CeB6 source is used in all the desktop Phenom SEM series of instruments. SEMs can be used in a variety of industrial, commercial, and research applications. SEMs are used in materials science for research, quality control and failure analysis. In modern materials science, investigations into nanotubes and nanofibres, high temperature superconductors, mesoporous architectures and alloy strength, all rely heavily on the use of SEMs for research and investigation. In fact, just about any material science industry, from aerospace and chemistry to electronics and energy usage, have only been made possible with the help of SEMs. Reliable performance of semiconductors requires accurate topographical information. The high resolution three dimensional images produced by SEMs offers a speedy, accurate measurement of the composition of the semiconductor. In fact, in just about all wafer manufacturing processes, SEMs are one of three essential quality control tools used. In the case of repetitive daily quality control tests, larger monitors (19 inches) have been shown to reduce visual fatigue for inspectors. Microchip production is increasingly relying on SEMs to help gain insight into the effectiveness of new production and fabrication methods. With smaller and smaller scales and materials, as well as the potential of complex self assembling polymers, the high resolution, three-dimensional capacity of SEMs is invaluable to microchip design and production. As the Internet of Things (IoT) becomes more prevalent in the day to day lives of consumers and manufacturers, SEMs will continue to play an important role in the design of low cost, low power chipsets for non-traditional computers and networked devices. Since SEMs offer the ability to examine a wide range of materials at high and low magnification without sacrificing depth of focus, their use in forensic sciences makes it possible to draw conclusions, identify material origins and contribute to a body of evidence in criminal and legal matters. The desktop Phenom GSR instrument is specifically designed for automated gun shot residue analysis. measuring the effect of climate change of species. forensic evidence is soil quality, toxins etc. Not all SEM applications are strictly practical. Micrographs produced by SEMs have been used to create digital artworks. High resolution three dimensional images of various materials create a range of diverse landscapes, image subjects are both alien and familiar. Browse this gallery for more. Within the fields of industrial application and research, there is an increasing focus on quality control at microscopic scales. 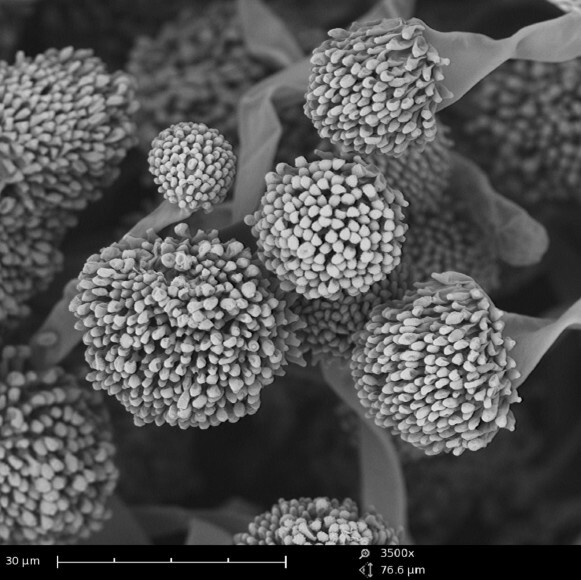 Achieving high resolution imagery with a scanning electron microscope can provide insight into many fields, making SEMs indispensable tools across many fields. Need help finding the right electron microscope equipment for your application? Contact ATA Scientific today to for a free consultation and discover the right instruments for your project. Looking for the perfect analytics instrument for YOUR next big discovery? What Is Spectrometry And What Is It Used For?